Meadowside seems to have had a rather extended summer break this year – more by accident than design as Life rather took over the last few months. By way of an apology (and to celebrate the arrival of EQ8 which was used to design them) we bring you these two quick and easy free Christmas projects to download. They are both on the same pattern sheet and you can choose whether to make a runner or a little quilt. Of course, there’s nothing (except possibly time) to stop you from making both. The runner is just three blocks and will finish at about 18 x 42 inches. You can choose to make yours longer or wider by adding more blocks or borders or giving your runner ‘pointy’ ends. The small quilt could be a wall-hanging or table topper and will finish at about 30 inches square – depending on the size you make your borders. And neither of them have to be made in Christmas colours – you could go mad and do one for each season. The pattern also includes a colouring sheet for both the runner and the quilt so you can design your own colourway. This entry was posted in Christmas patterns, Electric Quilt, free pattern, patchwork patterns on November 1, 2017 by Chris. We love the richness of the gold in this one. We just love the way this runner looks good no matter what fabrics you use, or where you place the emphasis. 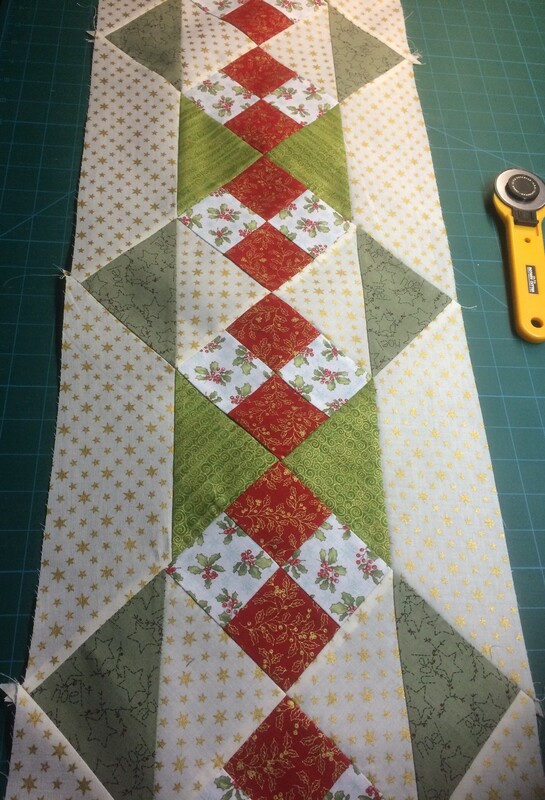 This entry was posted in beginners patchwork, Christmas patterns, machine piecing, patchwork patterns, table runner and tagged beginners' patchwork, Christmas runner, simple patchwork, table runner on December 9, 2015 by Chris. 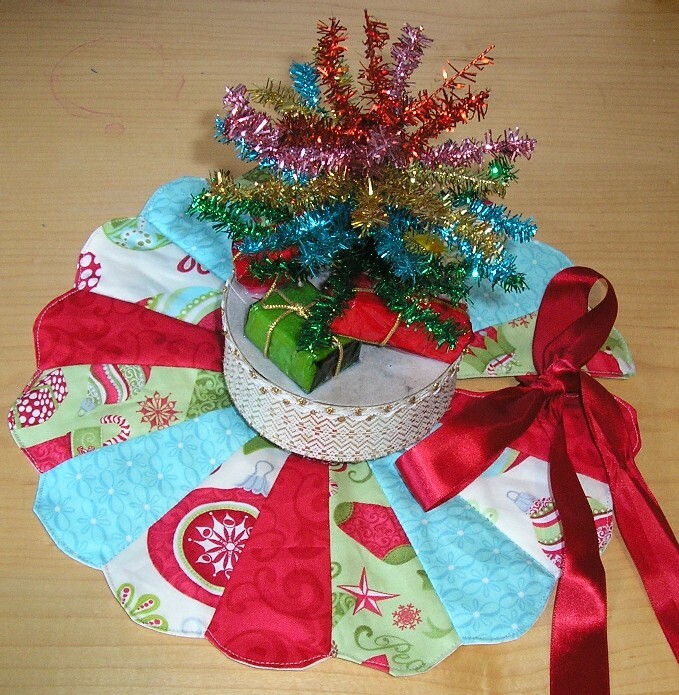 A new pattern has just been added to the Meadowside Designs Craftsy page – a mini Dresden Plate skirt for your mini Christmas tree or for a candle. Find the pattern here. This entry was posted in Christmas patterns on December 3, 2015 by Chris. Yes, we know its still August (just) but the Christmas fabrics are in the shops and we’ve still got some bits left over from last year but the new ones are very tempting . . . ! So to help you use up those left over pieces we’ve re-jigged a pattern written for Young Quilters by Dianne Clarke more years ago than any of us would like to think about. Sufficient to say that most of those Young Quilters are now adults, many with potential Young Quilters of their own. 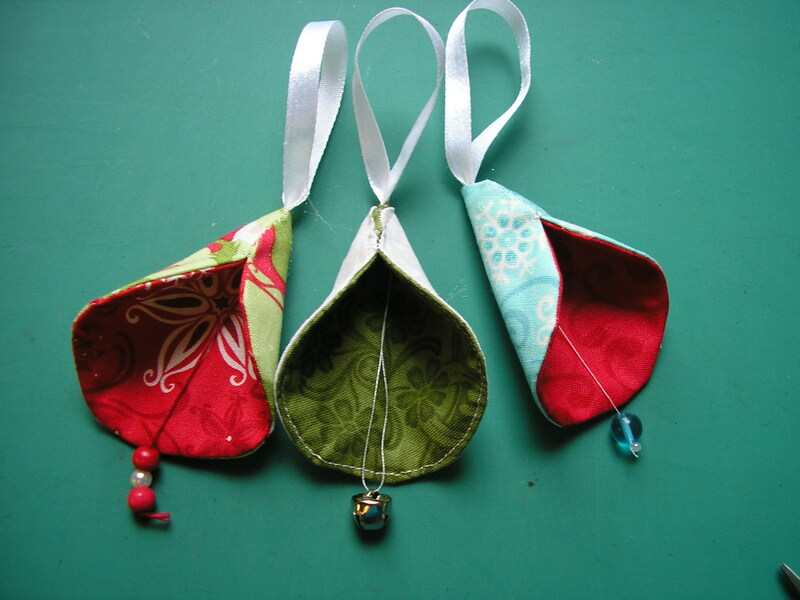 Christmas bells can be hung from the tree, turned into garlands (there’s some lovely Christmas ribbons out already to thread them on) or just added to wreaths and other decorations as an extra ‘garnish’! This entry was posted in beginners patchwork, Christmas patterns, free pattern and tagged beginners' patchwork, children's makes, Christmas patchwork, free pattern on August 23, 2015 by Chris.